Though I had a good time attending the SVP meeting in Raleigh, NC this month, it put me a little behinf on prep work. Jacob was able to join the preparation frenzy and between the two of us we've gotten a lot done. Getting the individual bones prepped out of their jackets is giving us some valuable insights. Though the bones are well preserved, each one is getting its own custom made Hydrocal support cradle to keep them from getting damaged during storage. We've uncovered the brow horns now, prepped out the left lower jaw, and finished the nasals. If you're in town you should consider stopping by to get an up-close look at the material. It's some strange stuff! We're on to the big jacket! Thanks to Scott Hartmann and Skeletaldrawing.com for permission to use his image of Avaceratops' skull. 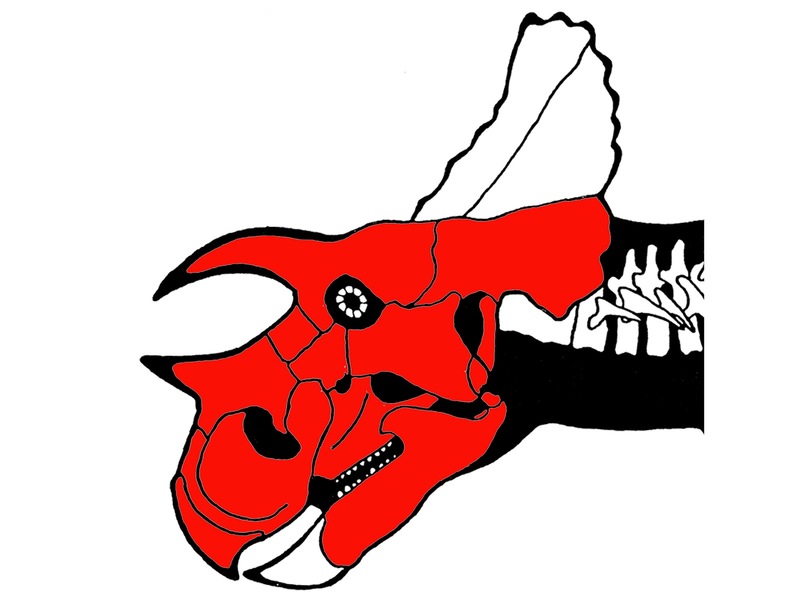 I haven't had an opportunity to expose everything in here yet (there are both postorbital horns hiding deep in this jacket) and I have removed 4 epoccipitals and an epijugal from the mass already, but here it is! Shown in all of its partially prepared glory you see both premaxillae, as well as one each squamosal, jugal, and quadrate. I also have 3 mystery bones comprising a possible parietal or exoccipital (wingy-thing part of the braincase), a possible palatine and another super thin feathery plate. The next step is to repair my air abrasion unit, cut down the jacket a little bit, and then look for those horns. I'm avoiding removing anything else since everything is so jackstrawed. Combine that with some surprisingly thin and fragile bones, and we could end up with a real mess on our hands.